#RanchersRelief and the Atlas Blizzard Rancher Relief Fund. We were on our way home from Rapid City and Wall last Sunday morning .. and had pulled off quick to put gas in the van and grab the kids a quick bite to eat. We both heard someone say the Cowboy’s name, approaching us from behind. It was an old friend from the rodeo circuit and the two spent a few minutes catching up. 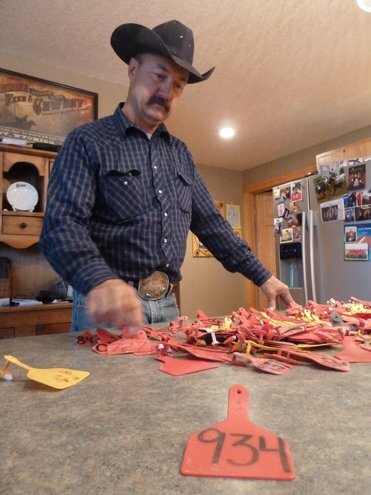 At some point though, in-between talking about families, jobs, roping and where each had been the past few years, the topic of the loss of livestock West River came up. “To some extent, these ranchers had warning this was coming. I feel terrible about the loss of life but they had time to get them in. It shouldn’t have been this bad,” this gentleman said. I was a bit taken back. There are a lot of opinions being given right now about what could or could not have been done. Regardless of who or what may be at fault for so many deaths, if anyone, the fact exists there is still incredible, unbelievable loss. And that is where we are at. I can’t imagine anyone expected what was coming, especially this early in the year and especially because things never seem quite as bad as they’re forecast for. After working many years in television news, I’ve seen it, I’ve taken the calls from people upset that you’re breaking into their favorite television show (not saying this happened in this situation at all. Just saying, it happens) to tell them about a pending violent storm that often barely ever touches their town with even a few raindrops. For most, the hype that goes into approaching storms rarely ever matches how bad a storm ever is. People get numb to it. But the forecasters do know, Mother Nature is unpredictable. And when the conditions are just right, sometimes those storms will be what is predicted. And they can only pray you pay attention. I believe this was one of those storms. And no matter what could have been done before the storm, there is this incredible, devastating aftermath. I don’t know that I’ll continue to write about this routinely. We don’t live West River. We’re not in the thick of it. I can’t as eloquently put into words what is happening as more storms hit the area, as ranchers wake each day and try to piece their herd, their lives and livelihoods back together. We however know some of these families and communities well. And we’d like to do whatever we can to support them. This entry was posted in Cowboy, Life, Ranch Living, Ranchers, RanchersRelief, Ranching, South Dakota, Storm Atlas, Uncategorized and tagged #RanchersRelief, Curt Pate, Loss of livestock, Ranching, South Dakota, South Dakota loss of cattle, The South Dakota Cowgirl by Carleen Wild. Bookmark the permalink. Thank you again. Beautiful writing! Thanks for your note and I really appreciate your words and that you stopped in. I am just starting to get back at this. Needed the hiatus. But I am really looking forward to reading your story. Thanks again for sharing and hope to stay in touch!